"El Viaje Mas Caro," or "The Most Costly Journey," pairs local cartoonists with migrant workers, who together create comics out of the migrants' experiences. For the nearly 1,500 migrant farmworkers in Vermont, there aren't many opportunities to share their experiences with each other. A project called "El Viaje Mas Caro" hopes to change that. 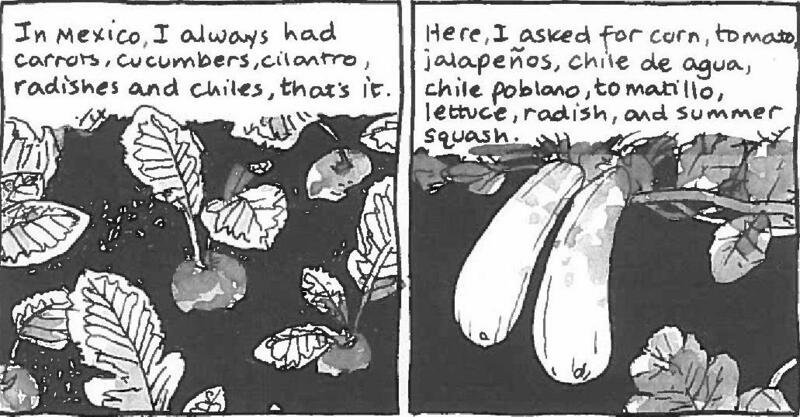 The project pairs local cartoonists with migrant farmworkers to draw out their stories. The five published comics containing the stories draw in different shades of the migrant experience. There's the journey - scenes of men crossing the desert, packs of tuna and cookies slung over their backs. There's the homesickness - a mother planting native Mexican vegetables in her garden. And then there are stories like Guadelupe's - one of the five cartoons that have been produced so far. In one scene, she rushes down a snowy hill. Her hand bleeds from the fight she's just had with her boyfriend. She's only wearing sandals. All she can think is - run, run, run, from the house. It's one of the scenes from Guadelupe's life, when she left an abusive relationship. Memories like that one made her hesitant about retelling her story. Before the coordinators of the project approached her, she hadn't even told it to her family about the abuse. "I was ashamed and embarrassed about what happened," she says. "El Viaje Mas Caro" - or "The Most Costly Journey" - is meant to be a therapeutic process for isolated farmworkers like Guadelupe, according to Julia Doucet. She's the nurse case manager at Open Door Clinic in Middlebury, which provides health care for uninsured adults. A excerpt from Guadelupe's comic depicting the moment when runs away from her boyfriend's home. Credit Courtesy of "El Viaje Mas Caro"
"There's a lot of healing that comes from knowing that you're not alone in the feelings that you're feeling," she says. Doucet started "El Viaje Mas Caro" after seeing many of her migrant patients come in with anxiety and depression. But many weren't willing to talk about it. "Cartooning seemed like a backdoor. It's just not as contrived as a mental health initiative," Doucet says. "It's connecting to a person through a story. And who doesn't love a good story?" The comics aren't accessible to the public yet. For now, Doucet and her collaborators pass the Spanish versions out at the farms they visit. "Honestly, the best feedback we can get is them looking at us and saying, "Wow - can we keep these and read them?'" Doucet said. 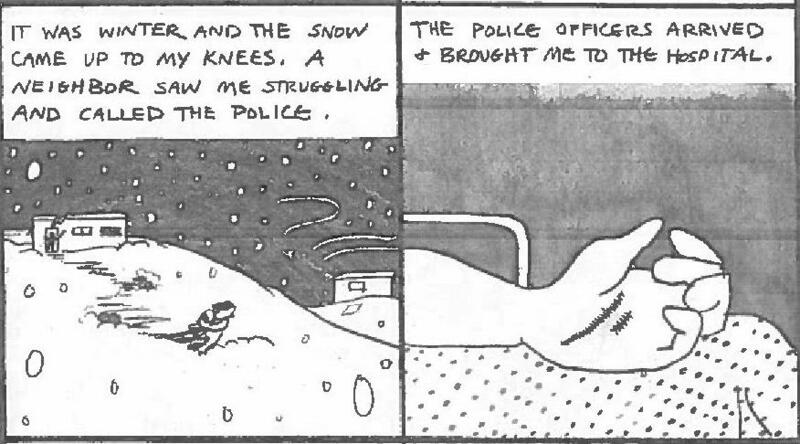 An excerpt from one of the project's comics, detailing a migrant's story. Translating these stories into a condensed comic can be tricky. It takes multiple drafts, and at times, fictionalizing the story to protect the storyteller. That's what Burlington-based cartoonist Iona Fox did for Guadelupe's cartoon. It took five drafts and over a year to finish. "Her story - she took a lot of risk in sharing it and I took that quite seriously," she says. When Guadelupe first received her completed comic, she read it by herself. "It was painful to remember because it was like living it through again," she says, tearing up. But she doesn't regret telling her story. On the back of the comic, Doucet included a phone number for an organization that helps victims of domestic violence. Guadelupe hopes her story can help others who may be going through what she did. In the future, Doucet plans to produce English versions of the cartoons to help educate the public about migrant experiences. The Himalayan country of Tibet came under Chinese control in 1959. And since then, many Tibetans have lived outside their country. Last weekend, tens of thousands of Tibetans throughout the world voted for their prime minister and parliament for their government in exile. Out of those votes, 88 were cast in Burlington High School and on the ballot was a Vermonter running for Parliament. It’s been over 10 years since migrant workers began arriving on Vermont’s dairy farms. Most of the workers have been young men who work for a few years and then return home to Mexico. But there are a number of families of farmworkers here in Vermont, and some, especially those with U.S. born children would like to stay. It’s been over ten years since migrant workers, mostly from Mexico, started making the long trip north to work on Vermont’s dairy farms. While many stay only a few years to earn money and then return home, some have decided to stay and make a life here in Vermont. Last fall, Vermont's Poet Laureate and Cartoonist Laureate collaborated on a unique project: a small book of illustrated poems. Poet Sydney Lea and cartoonist James Kochalka traded verse and drawing for what became Vermont Double Laureate Team-Up.